See, I was all set to write this really great thing about how this was the nerdiest and most geekarific weekend ever, and then the LAN on Saturday got moved to next saturday, breaking my unholy trinity. And there wasn't any tabletop gaming either, despite it being promised, or at least vaguely hinted at, so that puts a damper on things too. All things considered though, it was still (as weekends go) pretty damn nerdtatic. Friday night was winful. I went to a concert of awesome sci-fi theme music. 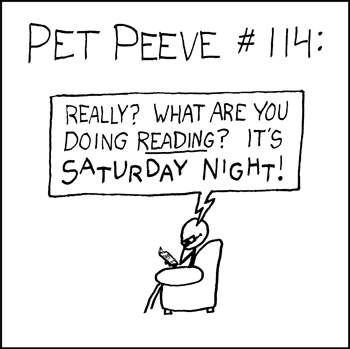 But replace "reading" with "listening to an orchestra" and "Saturday Night" with "Friday night"... And there's really nothing wrong with going to something like that on a Friday night- why am I even defending myself? Go away! So yeah, that was awesome. I got to geek out over awesome theme music and my mum and grandma came too, so that's nice. Sunday, in a case of a hideous triple-booking, was Archery-which-was-cancelled-because-of-rain-so-I-missed-seeing-that-French-dude-I-met-last-week (I guess that doesn't really count as a thing that was on, but anyway), then Justin's movie making day, which, if you're unfamiliar with them, involves copious fake guns and tomato sauce and teenage guys pretending to be saucy femme-fatales and stuff and no script at all, and they generally turn out pretty well. This time I feel was a little below par, possibly because we had a few too many people and an unfamiliar location, and wasted like half our time filming the briefing scene. Still, kudos to Justin for organising and editing, and you can find the finished product here. And then Sunday night there was the final episode of Doctor Who, and pretty much everyone from the movie making thing ended up coming along and we sat on bean bags and ate fish fingers and custard (seriously, not as bad as it sounds). So that was awesome. And since this is a thing which I'm writing and not someone else, I naturally have a couple of things to say about the episode. Firstly, YAY IT EXPLAINED EVERYTHING (except who owned the other time machine, and what The Silence is, and and who River is, and... well, okay, not everything. But the Pandorica and The Cracks (I like capital letters!) all got solved, right?). Second of all, well done, you used time travel to solve problems. That was very entertaining and worked quite well. Now please never do it again, and leave that kind of time travel problem solving to Bill and Ted. Kthx. Third of all, Amy = best companion ever. This was decided forever when (spoilers) the Pandorica opens in the alternate past and it's Amy inside, and she says... "Alright kid, this is where it gets complicated" title sting. Seriously. I'm sick, in the new series at least, of companions who are like Rose "'Ello Guv-na, Oim blonde and Oi have large breasts" Tyler or Martha "But I've got a massive crush on yoooooou" Jones or Donna "I LIKE SCREAMING" Noble, who were all totally useless and only ever good for being rescued. Oh, and next series should be awesome. That is all. Hopefully next weekend will allow the finishing of the necessary quota of nerdalicious activities for these holidays, but I highly doubt I will be bothered writing about it cause I'll be too busy writing other things like a creative writing assignment and an essay on The Tempest and that French assignment I haven't started. Sooooo yeah. That's about it for now. TTFN.